This Freight Policy is only good on internet orders. 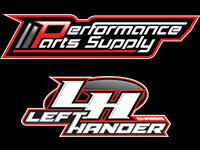 All non North American Orders must contact us at shipping@lefthanderchassis.com for wiring instructions. All non North American orders must be paid via wire transfer. Orders placed by 3 PM CST M-F will be shipped same day. We ship at our discretion using the following ways. UPS, Fed Ex, SpeedDee (where available), and USPS. Our Retail Freight & Handling charges are based on total dollars ordered before tax. On ground shipment ONLY within the contiguous 48 states. All items below are charged actual shipping cost. All items that are considered oversize can be shipped ground but require a ?ground oversize? shipment charge. The minimum charge is billed out at 30 lbs. There may be items on this site which are oversized but may not be indicated as such. We reserve the right to charge an oversize fee on any order which contains a product that is oversized, even though it may not be indicated on the site. Dimensional weight is use to figure the cost of shipping many ground packages and all Next day or Second day air package. We use UPS and Fed Ex for the majority of our shipments. Example: A package weighing 10 lbs could cost you a 30 lb rate because of its dimensions. This is based on the size of the box that we have to pack your order in. Your shipping amount will be calculated using this method. Lefthander Chassis does NOT pay taxes and duties on international orders. They will be due upon receipt.